International Cobalt Corp. (CSE:CO) focuses on primary cobalt projects, and while it has a couple of good land packages under its control in Idaho, a recently closed $10 million financing means the company now has the wherewithal to consider additions to its portfolio as well. Chief Executive Officer Tim Johnson explains the outlook for cobalt, why supply constraints are here to stay, and how International Cobalt is positioning itself to take advantage of the favourable supply/demand environment. What outlook for the cobalt market do you hold at International Cobalt and how does that shape your strategy in terms of project acquisition and allocating human and capital resources? We think prices will remain strong both near term and long term. Basically, we just cannot see anything on the horizon that’s really going to change the amount of cobalt coming on line. In December 2017, Glencore announced it was going to double their production in the DRC (Democratic Republic of the Congo) and there was no effect on the market whatsoever. As long as the battery space stays strong, we think cobalt will stay strong. This environment really puts us into acquisition mode – we are actively looking for new projects in the space. 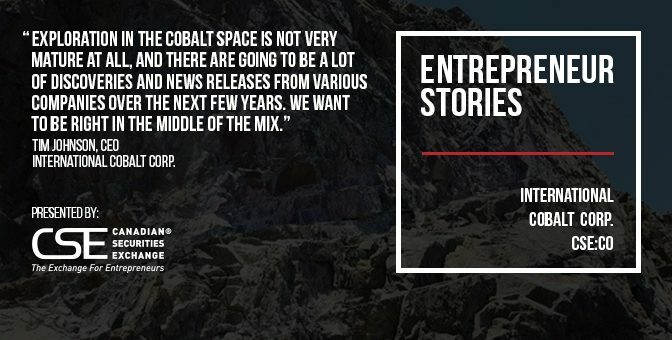 Exploration in the cobalt space is not very mature at all, and there are going to be a lot of discoveries and news releases from various companies over the next few years. We want to be right in the middle of the mix. Walk us through the components of your project portfolio. What has you the most excited and what work is upcoming? We’ve got two projects in the Idaho Cobalt Belt and we bracket eCobalt Solutions’ advanced project. Although there has been a fair amount of historic work done on our landholdings, the majority of it by Noranda in the 1980s, our team has not really had boots on the ground yet except for a site visit. We anticipate doing a full geological work-up on both projects, to include extensive soiling and mapping. I’d say half of our Blackbird project has not been mapped geologically. So, we are excited to get to work on the projects and because there are many companies in the belt, including us, there is going to be a lot more exploration. It is a world class belt as far as cobalt goes, so you are going to see lots of news coming out of it. You mentioned that you are in acquisition mode. What types of additional projects would appeal to you, and how do you assess them? We are looking for primary cobalt. We are not as interested in nickel secondary cobalt or silver secondary cobalt. Primary cobalt projects are few and far between and we are doing a lot of digging to find good ones, looking mostly in North America. We have feelers out in Africa as well, but any acquisitions we make in the near term are likely to be North American. Cobalt really is an underexplored mineral. It is not like the molybdenum days of the early 2000s, when once moly started to rise in price everyone had a near-term moly mine. A lot of work will be needed to bring supply on line. Does that mean most of the projects are early stage? Right now, most of the cobalt supply is from secondary sources such as nickel and copper. There hasn’t really been a focus on looking for primary cobalt projects, so anything you find is quite early stage. It is not like you are going to find something that was almost a mine and didn’t make it because of prices and now it is coming back up. And if you do find that it is most likely in the DRC. You know anything you get into is going to be a long-term project and you’ll have to structure your efforts to support that. The financial markets are supporting mining exploration companies once again. What observations do you have on the current health of the market, and particularly with regard to the cobalt space? Cobalt is definitely popular. There are a lot of financial professionals we have talked to who would like to get in on the space, but there are limited opportunities to do so. It has to do with the maturity of the exploration cycle – there really aren’t a lot of high-quality projects out there and the price of cobalt does not seem to be going down. Any decent projects have high valuations, and those are the projects the money is looking for. What kind of timeline are you giving interested parties in terms of the work you have planned. And are you only interested in projects you can own 100%? We are open to looking at other opportunities, whether it be joint ventures or strategic investment. Because we are an early entrant into the Idaho space you kind of wait to see how things shake out. I think the belt will potentially see consolidation, as there are some smaller players getting good results but there are no majors there yet. Once some of the juniors have more success the majors will come knocking. Cobalt is hot and there are lots of entities jockeying for position. Are they mostly Canadian companies or are some from other jurisdictions? There are a few Australian companies in the space, and money is coming out of Australia as well. We got some backing out of Australia and other companies we have seen did as well. Some groups that had success in the DRC are starting to look for safer jurisdictions. How are you going to pay for the acquisitions and work on the project portfolio? We recently closed a $10mln financing. Our plan is that the new capital would support at least two years of exploration. We are talking all of our ground proofing this summer, a potential initial drill program in the fall, followed by another drill program in 2019. That is the plan with our existing assets, so things could change, of course, if we completed acquisitions. International cobalt has enjoyed a good start to 2018 in the markets and on the corporate front. Is there anything else you’d like to comment on? Just that we are very happy with our land position in the Idaho Cobalt Belt. The historic data we are turning up is proving our theory right. There are new reports being made available by the Idaho Geological Survey all the time and each time we find one we get excited again. Most of the work is by Noranda so we have high confidence in its quality and really want to get boots on the ground and follow up on everything. Learn more about International Cobalt Corp. at http://internationalcobalt.com/ and on the CSE website at http://thecse.com/en/listings/mining/international-cobalt-corp.
Mining investment is back in a big way if the first quarter of 2018 is any indication, and it’s helping set the stage for one of the largest and most storied mines in the United States to finally come back onstream – the Bunker Hill Mine in Idaho’s Coeur d’Alene Mining District. Seasoned mining industry observers won’t be surprised to learn that the man behind the project is Bruce Reid, Chief Executive Officer of Bunker Hill Mining (CSE:BNKR). Reid has acquired, worked on and sold six mines in his career, five of which are currently in production (number six is slated to begin producing in 2020 or 2021). Bunker Hill will make seven and mark the culmination of an effort ongoing for over two decades. Sure enough, he got it, although the deal originally agreed with the heirs of the long-time owner was re-written in August 2017, shortly after Bunker Hill Mining began trading on the CSE. The Bunker Hill mine went into production in the mid-1880s and remained in operation until 1981. For many years early in its life it was said to be one of the largest mines in the world. “Bunker Hill leads the way as one of the most important mines ever in American history,” says Reid. “It produced over 35 million tons of high-grade lead-zinc, about 8.5% lead, 4.5% zinc and 2 to 3 ounces of silver. When it closed it had resources and reserves of over 60 million tons, or almost twice what had been mined. That is a major amount of rock waiting to be harvested, and the cost of getting the mine back up and running is far from astronomical. Just US$15mln would re-launch operations at 1,000 tons per day, and scaling up to 3,000 tons per day, as plans call for within two years, could make Bunker Hill the largest lead-zinc-silver mine in the United States outside of the gigantic Red Dog mine in Alaska, according to Reid. Why, then, if all that ore is just sitting there has the mine remained inactive for so long? The owner at the time proved hard to convince and the US Environmental Protection Agency (EPA) was heavily involved as well, running a wastewater treatment facility onsite to deal with acidic effluent. While the Mine itself was not involved, the associated lead-zinc smelter caused significant pollution in the entire Silver Valley and the district was the site of a billion dollar cleanup through the EPA Superfund. That is mostly completed now as the Valley is in much better condition. The deal now in place with the mine owners is a 24-month lease under which the project can be purchased for US$25mln over 10 years. Another US$20mln would go to the EPA, this amount a partial acknowledgement of costs accumulated for clean-up over the years. An operating Bunker Hill Mine would also pay the EPA $1 million per year to continue operating the wastewater plant. “The EPA has proven to be a good partner — they are reasonable,” says Reid. 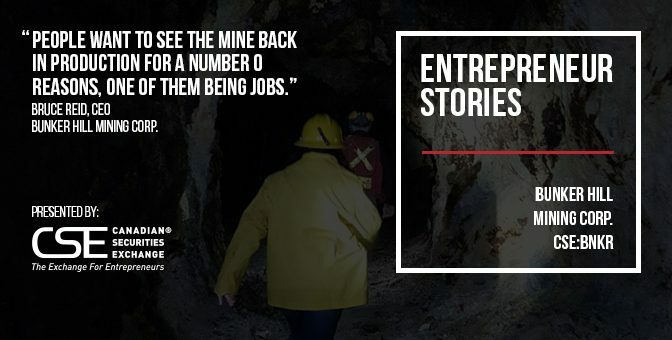 “People want to see the mine back in production for a number of reasons, one of them being jobs. But also, this mine, if left alone, will only get more troublesome as parts internally break and water starts leaking from different areas. If it’s in production, however, we’d have the cash flow and earnings to build up the closure bond, and to take care of many longer term problematic areas. Reid is not only a formally trained geologist, but also a former analyst and successful investment banker. He thus has detailed insight into the metals markets Bunker Hill would once again serve. And while one might think the omnipresent talk about future battery technologies would undermine the lead market, Reid says it is “amazing” how tight the lead concentrate market is right now. Details regarding the path to production for Bunker Hill are still to be decided but could entail initially toll milling (utilising another entity’s mill), although ultimately the company will want to build its own mill plant. It is an amazingly near-term timeline for a small company that began trading less than a year ago, but given the Bunker Hill Mine’s size, grade and favourable jurisdiction, plus the strength of Reid and his team of local professionals, the market is buying in, having taken the company’s share price as high as $3.15 since its debut. Also amazing to observers who know how the financial markets work is that Reid, his team and that the one large shareholder have put their shares into a voting trust and none of the shares can be sold until there is a change of control, which is another way to say that Reid must sell the entire company for the insiders to ever realise on their share positions. We’re talking approximately 15 million shares out of the company’s 33 million outstanding. That lock-up suits Reid just fine. He knows he has a monster by the tail and his track record suggests that few people could be better at finding a buyer when the time comes. 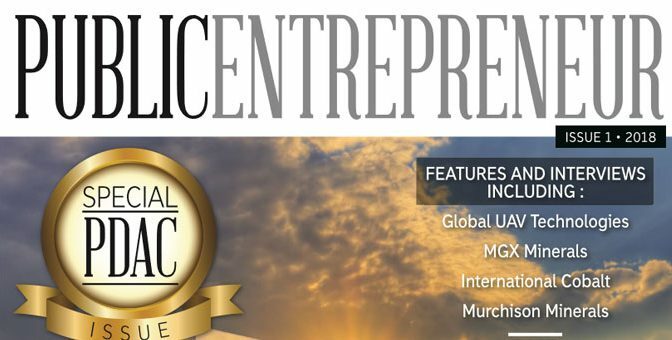 This story was originally published at www.proactiveinvestors.com on March 5, 2018 and featured in The Public Entrepreneur. 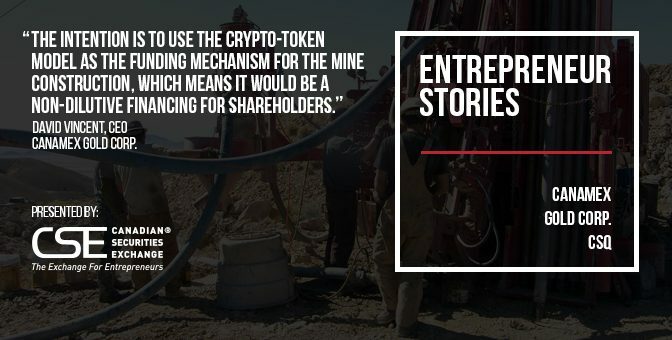 Learn more about Bunker Hill Mining Corp. at http://www.bunkerhillmining.com/ and on the CSE website at http://thecse.com/en/listings/mining/bunker-hill-mining-corp. Welcome to inaugural issue of Public Entrepreneur, the new magazine published by the Canadian Securities Exchange (CSE). 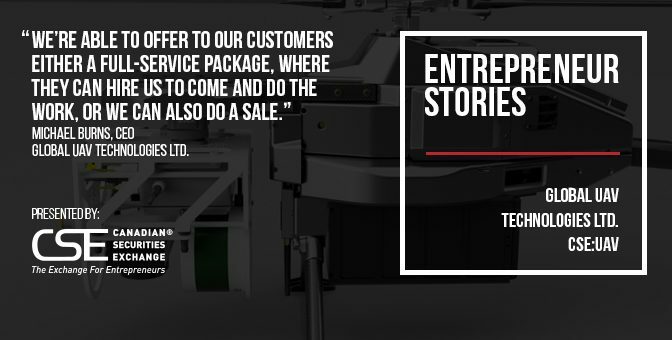 Public Entrepreneur represents a bold and exciting new chapter in the CSE’s story, one that will better reflect the growing presence of the “Exchange for Entrepreneurs” in the Canadian public market space. With over 350 securities now listed on the CSE and more joining every day, share turnover measured in the billions and innovative new services, like tokenized securities being brought to market, we believe this new magazine will chronicle the next chapter in the CSE’s storied commitment to public entrepreneurship. To that end, Public Entrepreneur will continue the traditions started by its predecessor, the CSE Quarterly, namely, to focus on the stories and entrepreneurs that emerge from CSE-listed issuers. Publication will also continue to take place quarterly. What is new, however, is that Public Entrepreneur will also broaden its scope to include coverage of the opportunities and personalities that shape life in Canadian public markets. 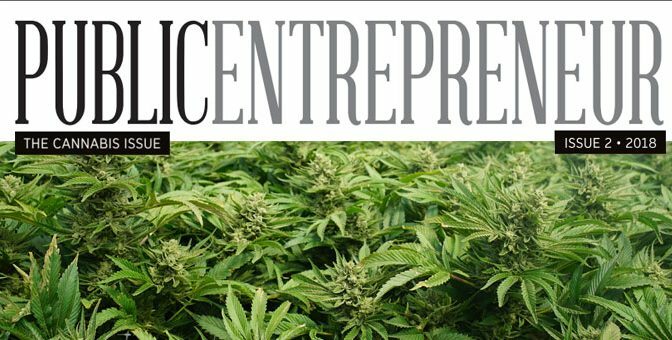 We hope you enjoy this first issue of Public Entrepreneur and look forward to bringing readers even more great content in the next issue. For readers interested in accessing archives of the CSE Quarterly, click here.